I know I haven't blogged in awhile and this isn't tech related BUT my wife (Cassondra Bellows) managed to be a finalist for the Zoo Photo Contest! Please go to this page http://a.pgtb.me/rk1Bck and vote for her! Her picture is in the Just Keep swimming section. It's the 7th picture and it's of the Leafy Sea Dragon. (It also says her name) Just click the little box to vote for her! This is important to her, so please vote! "The CFbuilder executable launcher was unable to locate its companion shared library"
"You do not have sufficient access to uninstall Adobe Coldfusion Builder 2. Please contact your system administrator." Which is weird because I should have admin permissions. After looking online it seems that others have seen this error but there was no solution. Just for fun I decided to rename my Adobe directory (c:\Adobe\) which is where eclipse and what not is installed. After I did that I re-ran the installation for CFB 2.0.1 and wala it worked. Kind of hacky but seemed to work for me. JSLint complains about unnecessary brackets because of code being commented out. This is slick because if I don't need the function call then I don't need the call. (don't need commented out code if you are using some sort of version control). Another slick thing about Adobe Brackets is that since it's built using HTML/JS/CSS you can tweak any of the settings by jumping into the source code. I do warn you tweaking this can cause issues with rendering the IDE mainly because it's not fully stable yet. I should warn you that it's in what I call pre-alpha stage. This is probably known to many but I was looking into this for fellow co-workers and I figured I would blog it so I don't forget it in the future. PhoneGap is great at making an HTML page into an mobile application. The thing with HTML is, it's static. You can't do direct database calls on load. Here is a quick solution I have found that seems to work. If other's have found a better solution, please post it. So really all I am doing is making a call to a cfc on load that returns some content and then adds that content to a div. Pretty simple. Also, in development putting them on new lines is great for readability. Coldfusion Builder by default wants to format them to one line. I will begin with a little back story. So I manage an internal User Group inside the company I work for (ImageTrend, INC). I proposed a challenge to the attendees to come up with a cool implementation of an app using the Twitter API. Very similar to Ray's code for the one time authentication but I wanted to database the tokens that Twitter returned so in the else if I check to see if the user exists and I have stored their token if they do not exist I database the token and secret so they don't have to authorize the app every time. Once this is complete you can do pretty much whatever is available from the Twitter4J class library. I apoligize if this is a scattered post wanted to do a quick write up. If you have any questions/concerns I am more than willing to try and answer. I was blessed to be able to attend cf.Objective() again this year. I will be posting my notes as I did last year. I hope to meet any of the people that read this blog. I will be the guy with the big beard. 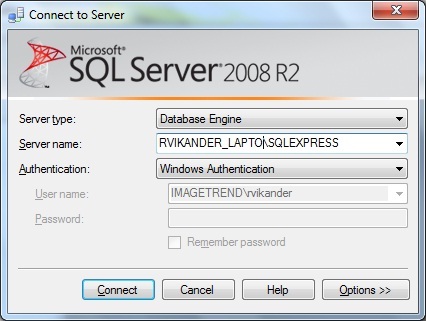 So I know there are a few articles out there on this subject but I seem to have to reinstall sql server on my laptops often and I always have to hunt down how to do it so I thought I would post a blog so it would be a bit more recent. I won't go over installing SQL Server Express, it takes a while seems like a good 30 minutes. Anyways, once you install it you can connect to your local database by connecting to the server (depending on what you named your server) [PC_Name]\SQLEXPRESS and depending on if you are using windows authentication you would enter your user name and password. Ok so once you've gotten that installed there are some more tricky stuff you need to do within SQL Server. First you will need to turn on TCP/IP which is located under Start > Microsoft SQL Server 2008 > Configuration Tools > SQL Server Configuration Manager. Once you open up the manager go under: SQL Server Network Configuration and click on Protocols for SQLExpress (I assume this the name of the server). By default TCP/IP is disabled. So enable it by right clicking and enabling it. You will be prompted to restart your server service but I would wait until finished to do so. Now double-click TCP/IP or right click and go to Properties. Go into the IP Addresses tab and for each IPs enter in under TCP Port 1433. This allows for Coldfusion to connect to your database. Now you can apply and restart your server service. If anyone has any thoughts or questions I would love the comments. Otherwise I hope this helps someone.